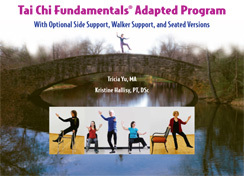 The Tai Chi Fundamentals® Adapted Program is designed to make tai chi accessible to people of all ages and abilities, and features versions for use with optional chair support, walker support, and when seated. This book is an ideal resource for personal home use as well as for community and senior centers, independent and assisted living facilities, long-term care, outpatient clinics, rehabilitation facilities, home health or anywhere where people wish to exercise with support when needed. This clear, beautifully presented book provides an introduction to tai chi, its mind body principles and guidelines for practice Includes detailed descriptions and photographs for all three versions, ideas for learning and teaching tai chi, mind/body skills, tai chi as evidence-based practice, biomechanical analysis, applications for rehabilitation, examination and treatment. As a physical therapist who has incorporated Tricia's and Kristine's approach to tai chi in my teaching of courses for physical therapists, . . .